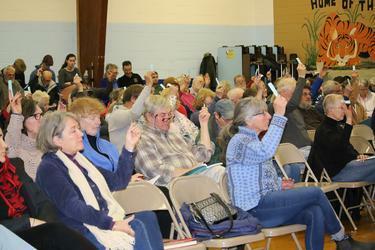 Penobscot residents cast their votes with a hand raise during town meeting on March 5. Article 50 on the Penobscot town meeting warrant asked voters to approve $10,000 from taxation to be put into a reserve account for internet broadband to be used in the coming years. This amount did not seem enough for several voters at town meeting, and instead of approving just $10,000, they amended the article to allocate an additional $90,000 from surplus for a grand total of $100,000. That approval did not come before a lengthy discussion among the over 60 in attendance on March 5. Joel Katz and John Albrecht, two members of the internet broadband committee, explained that the money was not going to be spent right away, but that it would go into a reserve account to show a “serious commitment” from the town to bring better internet services to as many townspeople as it can reach. The amount of money was concerning to some residents, as well as whether or not bringing better internet speeds to every household in Penobscot could come to fruition. The bottom line, according to resident Sue Shaw, was that the $90,000 was already an amount in the surplus budget, so to move it into a different account and continue to not use it until it was needed was a decision that made sense. After almost half an hour of discussion, the question was called, and the voters approved the amended article for $100,000. Another article that sparked discussion was the one concerning snow removal. The finance committee recommended the voters raise $150,000, with an additional $45,478 coming out of the reserve account. The $150,000 was the same amount raised last year, according to selectmen. “Who is responsible, and can we find someone who will actually do it,” said Skillen. Road Commissioner Bill Hutchins stood up and explained that the overall problem is that the condition of the roads are structurally in poor shape, making it difficult to plow them and keep them as clear as smoother roads like Route 15. The article was ultimately approved by voters. In all, the entire 60 article municipal warrant was approved by voters, for just over $640,000. While the municipal warrant took about two hours to approve, the school warrant was approved in much quicker fashion by a noticeably larger group of voters. It was moved and seconded to approve all 18 school articles at once, totaling $1,860,850, as the amounts requested and the amounts recommended by the finance committee were agreeable across the warrant. After moderator Sherm Hutchins read through the school warrant in its entirety, it was moved and seconded for approval. Sylvia Tapley won a three-year term on the Penobscot Board of Selectmen, receiving 139 votes to outpoll candidates Toni Staples (36) and Janine Kimball (15). James Goodman received 151 votes in an uncontested race to serve another three-year term on the Penobscot School Board, and Ed DeVito received 48 votes as a write in candidate for the school board. 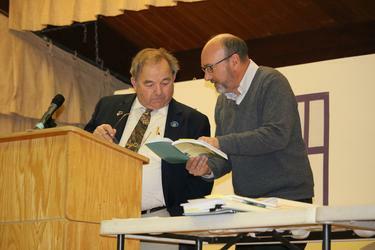 Penobscot town meeting moderator Sherm Hutchins, left, and Union 93 Superintendent Mark Hurvitt discuss a school warrant article during town meeting on March 5. 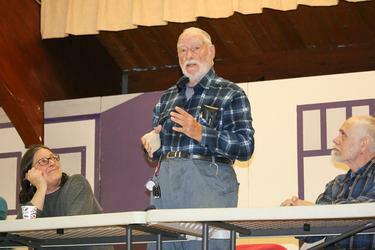 Fred Briehl comments on his time spent on the Penobscot School Board during town meeting on March 5. Briehl did not run for reelection. 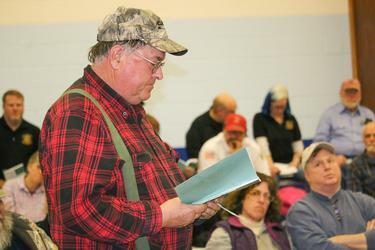 Penobscot Road Commissioner Bill Hutchins explains the difficulties of keeping the roads in Penobscot plowed and clear each winter during town meeting on March 5.